India's Supreme Court upheld the death sentence for the sole surviving terrorist who killed 166 people in Mumbai in 2008, including 6 Jews. India's Supreme Court has rejected an appeal of the death sentence for the sole surviving terrorist who murdered 166 people in Mumbai in 2008. Pakistani terrorist Mohammed Ajmal Kasab, 24, was convicted of murder, waging war against India, conspiracy and terrorism. He was sentenced to death for his crimes in May 2010. For three days in November 2008, Kasab and nine other members of the Lashkar-e-Taibe terrorist group rampaged through Mumbai in multiple locations, including the Nariman Chabad House, two luxury hotels and a crowded train station. Chabad-Lubavitch emissaries Rabbi Gavriel and Rivka Holtzberg were murdered during the assault, along with four of their guests at the Chabad House. The only Jew who survived the bloodbath was their 2-year-old son Moishe, who was saved by his Indian nanny, Sandra. "In view of the nature of the gravity of his crime and the fact that he participated in waging war against the country, we have no option but to uphold his death penalty,” ruled Supreme Court Justices Aftab Alam and CK Prasad on Wednesday. The sentence had been confirmed in February 2011 by the Maharashtra High Court. 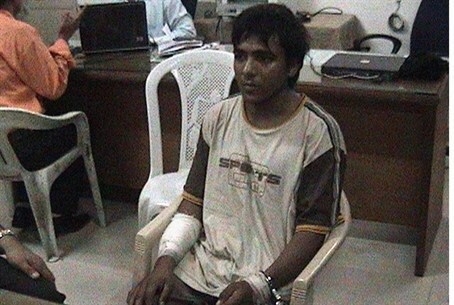 Kasab's sole remaining legal option would be to appeal to India's president for mercy.